Restaurants were a big job gainer, adding 40,700 jobs in December compared with an average of 19,600 over the last year. The Bureau of Labor Statistics reported the economy added 312,000 jobs in December. It also revised upward the reported job growth for the prior two months by 58,000, bringing the three-month average to 254,000. In spite of the strong job growth, the unemployment rate edged up to 3.9 percent. This was due to a rise in the labor force participation rate of 0.2 percentage points, as the labor force grew by 419,000. The employment-to-population ratio (EPOP) was unchanged at 60.6 percent. Job gains were widespread across sectors. The biggest job gainer was health care, which added 50,200 jobs, well above its average of 28,800 over the last year. Restaurants were also a big job gainer, adding 40,700 jobs in December compared with an average of 19,600 over the last year. Construction added 38,000, likely aided by relatively good weather in December. Manufacturing added 32,000 jobs in the month, in spite of the continued growth in the trade deficit. Employment in the sector is now up by 284,000 over the last year. 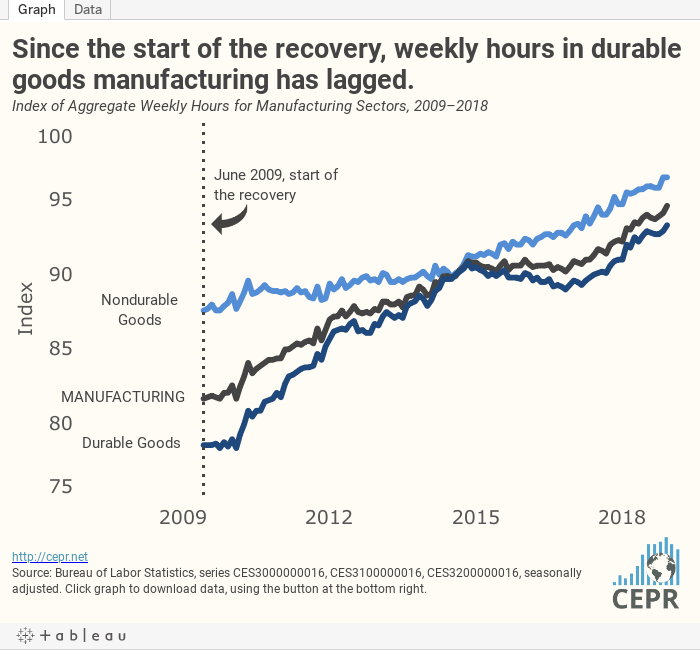 There had been some shortening of the average workweek in manufacturing, especially in the durable sector, which limited the increase in the index of aggregate hours between July and November to just 0.1 percent overall and left it flat for durable manufacturing. However, an increase in the average workweek in December caused the overall index to rise 0.5 percentage points and the durable index to increase 0.4 percentage points. Retail also had an unusually good month, adding 23,800 jobs, well above its average of 7,600 over the last year. The information sector shed 1,000 jobs in December. It is down by 16,000 (0.6 percent) over the last year. Telecommunications was the biggest job loser over the last year; motion pictures and publishing also lost jobs. There was a modest pickup in wage growth in the month, with year-over-year growth in the average hourly wage of 3.2 percent. The growth rate comparing the last three months (October, November, December) with the prior three months (July, August, September) was 3.3 percent. With productivity growth remaining near 1.0 percent, in spite of the tightening labor market, this pace of wage growth will either lead to somewhat higher inflation or a squeeze on profits. Given the large rise in profit shares in the recession, it would be reasonable to expect workers to gain share back at the peak of the recovery. Most of the news in the household survey was also positive. With the overall EPOP remaining constant, the modest rise in the unemployment rate should not be a cause for concern. The employment rate for prime-age workers (25 to 54) also was unchanged. It now stands 0.6 percentage points above its year-ago level. All of this increase is among women, their prime-age EPOP is now up 1.1 percentage points from year-ago levels. There was a rise of 0.6 percentage points in the unemployment rate for black workers to 6.6 percent, which was associated with a 0.4 percentage point drop in the EPOP. These numbers are highly erratic, but this is the lowest EPOP for blacks since April. Less-educated workers continue to be the biggest job gainers. The EPOP for workers with just a high school degree rose by 0.3 percentage points in December. It is up 0.6 percentage points over the last year. By contrast, the EPOP for workers with college degrees fell 0.1 percentage points in December. It is up just 0.1 percentage points over the last year. The EPOP for workers without high school degrees fell 0.6 percentage points in December, but is still up 1.3 percentage points over the last year. The share of unemployment due to voluntary quits jumped to 13.3 percent from 11.6 percent in November. This is somewhat near the high for the recovery, but still well below the peaks hit in 1999 and 2000. There was little change in the duration measures of unemployment, all of which are near lows for the recovery. The rise in involuntary part-time employment reported for November was largely reversed, as was the decline in voluntary part-time. Nonetheless, voluntary part-time stands just 71,000 (0.3 percent) above its year-ago level, meaning it declined as a share of employment. On the whole, this is a very positive report. The economy is adding jobs at a rapid pace. The tightening labor market is putting workers in a situation to achieve wage gains, as was the case in the late 1990s. However, we have yet to see a pickup in the pace of productivity growth as we did in that decade. The strong October job growth was largely a bounceback from a hurricane-weakened September.